The Grape Beyond is a matte purple with subtle turquoise shimmer. All nails are 2 coats with no top coat. When matte the shimmer is really subtle, but it's purple so it's an automatic love for me! Formula was easy to work with; a bit streaky the first coat but evened out perfectly in 2 coats. Here is The Grape Beyond with 1 coat of top coat. Would Jubilee It? contains a mixture of aqua, fuchsia, sapphire and silver glitters in various shapes and sizes. Shown is 1 coat over 2 coats of The Grape Beyond with top coat. This is a great fun glitter mix with a little bit of something for everyone to love! :) It goes great with The Grape Beyond and over other colors. Formula was perfect and I didn't need to fish out any glitter. All nails are 1 coat of Would Jubilee It? over KBShimmer 24 Carrot Bold with top coat. This duo is set to be released on August 8th through KBShimmer.com. KBShimmer sells not only nail polish but soaps, lotions, lip balms and more! 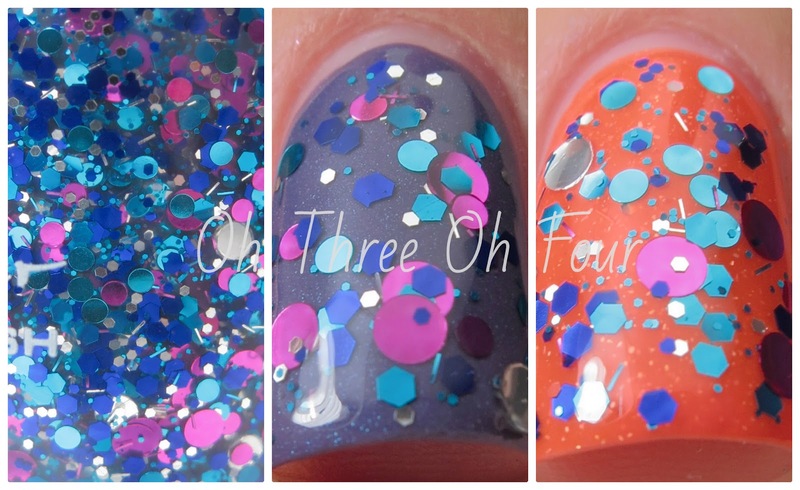 KBShimmer products can also be found through Harlow & Co. There are a lot of fun things planned for KBShimmer's 5th birthday, so make sure to follow them on Facebook, Twitter,Instagram and Pinterest!